The other day, a girlfriend and I were hanging out and conversing about life, and the subject of relationships came up. We spoke about some of the challenges that women face in singleness and marriage and how the cliche “Jesus is my husband” romanticizes the Lord and can be an unhealthy coping mechanism and a form of denial for single women who desire marriage. I shared with my girlfriend that when I was single, I never claimed that I didn’t want a husband, referred to Jesus as my “husband,” or pretended that being complete and content in Christ meant that I always felt fulfilled and satisfied as a woman. Yes, Jesus was (and is) my everything. 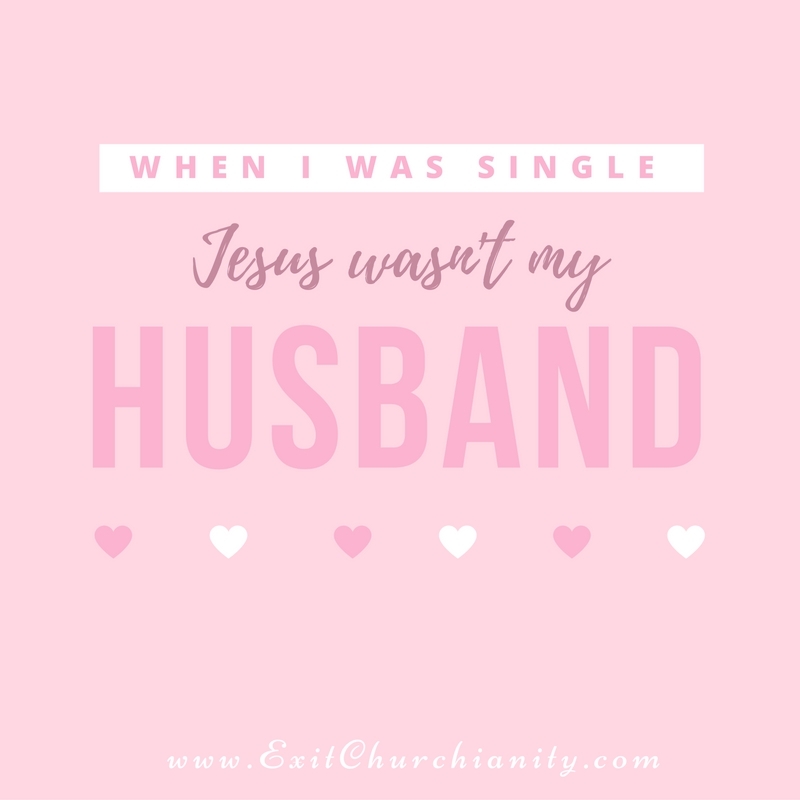 He is my God, my righteousness, my Savior, my Redeemer, my King, my High Priest, my Good Shepherd, my Rock, my Mediator — but no, He wasn’t my husband when I was single. There was a loneliness and a longing within my heart and body that only a husband could satisfy. There were desires and endeavors that could only be fulfilled through the companionship, affection, and support of a husband. Just as it wasn’t good for Adam to be alone. It wasn’t good for me to be alone either. Some people are ordained by God to be eunuchs and given the spiritual gift of lifelong singleness and celibacy. This is a beautiful and honorable calling, and it is worthy of just as much encouragement and support as marriage. But I knew that God didn’t call me to lifelong singleness and celibacy. I desired a righteous man who was suitable for me, to protect, provide, produce, problem-solve, and hold my hand as we followed Christ together, built a family legacy together, laughed together, went through hardships together, and got on each other’s nerves together. Of course, in regards to salvation, I knew that I didn’t need anyone except Jesus. But in regards to marriage and family, I knew that I needed a husband. Is It Biblical To Say “Jesus Is My Husband”? I see nothing in Scripture which directly states or implies that Jesus is the spiritual husband of single women. What I do see is that in the Old Testament, God is analogized as the husband of the nation of Israel, and the nation of Israel is analogized as a wife or virgin who is betrothed to God. See Isaiah 54:5, Ezekiel 16, Jeremiah 31:32, and Hosea 2:16-20. In the New Testament, Jesus is analogized as the husband or bridegroom of the Church, and the Church is analogized as a wife, bride, or betrothed virgin who belongs to Christ. See John 3:29, Mark 2:19, Matthew 25:1-13, Romans 7:4, 2 Corinthians 11:2-4, Revelation 19:7, Revelation 21:2, and Revelation 21:9-10. God often used analogies in Scripture to demonstrate a higher spiritual truth. The purpose of the husband-wife/bridegroom-bride analogy was to demonstrate God’s love for and faithfulness to His covenant people, the unfaithfulness or harlotry of God’s covenant people, the union or oneness between Christ and the Church, the believer’s relationship to the law of Moses and sin, to give us a glimpse into the future of the marriage of the Lamb and His bride, etc. But nowhere in Scripture is the husband-wife/bridegroom-bride analogy used to demonstrate that Jesus is the spiritual husband of individual single women. This idea is foreign to Scripture. Scripture makes a distinction between Jesus as the husband or bridegroom of the Church collectively, and a literal husband. It does not intertwine the two. But some women are tangling the two together because of false religious ideas floating around the church. Husbands are being placed in the position of Christ which turns them into an idol, and Christ is being placed in the position of a husband which turns Him into a romanticized “Heavenly Mr. Right” which is wrong, unhealthy, and frankly, kind of creepy. Some of us need to untangle who Jesus is from what a husband is, and sanctify Jesus as Lord in our hearts instead of attributing a role to Him that Scripture does not. If Jesus Is The Husband Of Single Women, Is The Church The Wife Of Single Men? My friend and I found it interesting that we have never seen a single man say, “the Church is my wife.” There might be a few men out there who have said such a thing, but I have never run into them. I have never seen any memes or books that romanticize the Church as the “spiritual wife” of individual single men in order to make them feel fulfilled and content in their singleness. The idea of the Church being the “spiritual wife” of single men would not be trendy or lucrative, because it is not attractive or appealing to most single men. It would come across as just as weird and unbiblical as the idea that Jesus is the “spiritual husband” of single women. Single men who are serious about getting married prepare for it and look for a wife. They do not romanticize the Church as their “spiritual wife” while they are still single and pretend that the Church can fulfill the role of a literal wife and satisfy their desires until they meet that special woman. Just as the Church is not the “spiritual wife” of single men, Jesus is not the “spiritual husband” of single women. If we are not going to promote romanticized analogies to single men in place of a literal wife, then we need to stop promoting romanticized analogies to single women in place of a literal husband. A coping mechanism is a method or strategy that a person uses to manage stress or deal with difficult situations and circumstances. People adopt different kinds of coping mechanisms to deal with life experiences that cause stress, pain, or trauma. You try to be strong and optimistic, but there are times when you feel lonely, depressed, dissatisfied, disappointed, frustrated, bitter, unfulfilled, upset, apathetic, and jaded. There are times when you are burning with passion and your body is telling you that your biological clock is ticking. For women, the older we get, our fertility rate decreases and the probability of infertility increases. You wonder if you will ever get married considering the world that we live in and the fact that marriage does not happen for everyone. These feelings and thoughts linger in the minds of many single women. My friend and I agreed that some single women are trying to cope with these unpleasant feelings and thoughts by calling Jesus their husband. Some women dive deeper into ministry and busy themselves with church work. Some use food to comfort themselves. Some shop til they drop and accumulate material things. Others immerse themselves in their career or keep going back to school. Some romanticize Jesus as their husband, boyfriend, or lover, or say that they are having a “date night with Jesus” in order to mask their true feelings of loneliness and unhappiness. Don’t get me wrong. I’m not saying that there is something wrong with leaning on Christ in order to cope with the struggle of being single and desiring marriage. Jesus can and does comfort our heart. He said that He would not leave us as orphans, that He would come to us (via the Holy Spirit, the Comforter), and be with us until the end of the age. But we do not need to place Jesus in a role that Scripture does not (a personal “spiritual husband”) in order to be comforted by Him. The Lord was my consolation when I was single, and I knew that in Him, I had a High Priest who could sympathize with my weaknesses and I could draw near with confidence to the throne of grace, so that I might receive mercy and find grace to help me in my time of need (Hebrews 4:14-16). There were emotionally “cloudy days” when I was single and there was nothing that anyone could say or do to brighten my mood. It was during these times, when man couldn’t comfort me, that Jesus did. And during these times, Jesus wasn’t “being my husband.” He was being my High Priest as Scripture teaches. Even now that I am married, I still have days where I struggle emotionally, and the Lord is present as He promised to provide mercy and grace. Sure, my husband can pray for me and pray with me, but only God can comfort my soul. Just as there are things that my husband cannot do for me because he isn’t my Lord and Savior, there are things that Jesus doesn’t do for me because He isn’t my husband. Christ’s role is unique, and my husband’s role is unique. And it is important that women (including myself) don’t blur the lines of distinction and tangle them together. It is normal to desire marriage and desire a husband. If this has not happened for you yet, it is normal to feel emotional pain, and you don’t have to hide that pain behind platitudes like “Jesus is my husband” and pretend that the Lord is satisfying your desire for a husband. The Lord never intended to satisfy our desire for a spouse or provide the companionship of a husband or wife. This is why after He created Adam, He said that it was not good for man to be alone and created a woman for Adam. Adam already had close fellowship with God, but the Lord saw that he needed intimacy with a woman. If you desire a husband, don’t deny it. Don’t cover it up. Don’t pretend that the Lord can compensate for a husband. Don’t pretend that you are strong, happy, and “content in your singleness” all of the time. Take the mask off! You aren’t less of a woman, less spiritual, desperate, needy, or weak for acknowledging your desire for a husband, and you aren’t guilty of sin for feeling down about being single. It is okay to express grief, dissatisfaction, and unhappiness — just don’t wallow in it forever and let your emotions lead you and dictate your decisions. Acknowledge how you feel, pray about it, confide in trustworthy friends about it, and be led by the word of God. In the mean time. . . single ladies, until you say “I do,” Jesus isn’t your husband, your boyfriend, your boo, or your bae. He is King of kings and Lord of lords, and may we all reverence Him as such. Previous Article I’m on TuneIn Radio! I’m glad I came across your youtube videos. I’m a new Christian and the one thing I’ve said is that I must be honest with God. I overheard a woman once tell a non-Christian that she was married to Jesus. I frankly thought she was a bit bonkers. I look forward to listening/reading more from you. This was refreshing to read. I have always had reservations about women referring to Jesus as their “boyfriend or husband”. I am guilty of putting up hyper-spiritual facades as it relates to marriage in an effort to make being single easier to cope with. And, also so that others won’t pity or worry about me. But, Holy Spirit has given me so much insight on marriage and I am grateful to have come across this article, which has been a blessing of confirmation and encouragement. I hope to read more of your writing. I am in a bit of a different boat. I am not single but am married to a man who is “emotionally inept.” I have been emotionally lonely my entire marriage – 20+ years. I am lonely and depressed. He’s a “nice” guy who is clueless. Counselors have told me to forgive him… he doesn’t know how… he’s emotionally inept… then I get a “good job” that I am hanging in there. When my children were young they kept me busy but now that they are older I cry often and have to shut down my needs and desires just to function. I spent my entire marriage seeking this emotional connection but it is not there. I haven’t slept in our bedroom in almost two years and he’s adapted and keeps pretending things are okay… or he’s waiting for me to change. I have no idea. How would you handle this? I’m not sure. I am so sorry to hear about your marriage troubles. Have you and/or your husband sought professional counseling? Wow. Great article, Evelyn. I had never heard the weird idea about single men being “married to the Church.” And the insights you shared about single women trying to suppress their true feelings and drifting into a false realm of being satisfied with Jesus being their husband are phenomenal. I was born again but did not have understanding of God’s Word until after marriage, so I never went through these things. Thank you for writing about this so that I can minister to single women with greater understanding! Thank you Donna = ) I really hope that the article helps sisters and brothers in the Lord. God bless you and Rich as you minister to God’s people and bring forth much good fruit to His glory! Thank you for your insightful perspective. It was needed to clarify to single women that there is nothing wrong with desiring marriage…however, we shouldn’t look on it as a replacement for the Messiah, Jesus. Thanks again for the lovely article. I (anita) recently saw a meme which basically told women they should be looking for a man whose eyes were so focused on God that the man only looked at her when God told her ‘this is the one’. This is the same thing you are talking about. It was a shame because both men and women commented on this meme basically sharing feelings of inadequacy because their eyes were not solely on God and lamenting that they would never find a man like this. I couldn’t stand it any more so basically shared the same exhortation you have just shared. Clearly the Spirit is trying to cause us to be balanced individuals who make sane decisions based on truth and reality not religious fantasy that actually amounts to Hollywood stereotyping! Thank you for stopping by and sharing that observation. That is disturbing for sure. I have also seen memes and messages like that. . . a similar one that has always rubbed me the wrong way is this saying that “A woman’s heart should be so lost in God that a man must seek Him in order to find her.” Some women seem to interpret being “lost in God” with being at church functions all the time, doing lots of religious busy work, or being hyper-religious and talking about nothing except religious/spiritual subjects. While there is nothing wrong with attending church functions and speaking on the things of God (the things of God would naturally flow out of the heart of a believer if the word of Christ dwells in us richly), but when someone has the wrong idea of what it means to be “lost in God,” especially if they are encouraged to be in the building all of the time and do lots of church work, this can leave little to no time for a social life outside of one’s local assembly. One can end up becoming a “busy Martha” in the attempt to be “lost in God,” or “so focused on God” that one becomes difficult to relate to, impossible to get to know, or come across overly-‘spiritual’ as if one just floats around on a cloud playing a harp while quoting Scriptures and their feet never touch the earth. This can be off-putting. It can also be legalistic and make people feel like God won’t “send them a husband or a wife” unless they are hyper-religious and in conformity to some man-made rule or fantasy. As you said, I think that the Spirit of God is bringing this stuff to our attention so that we are balanced, level-headed men and women of God who make decisions based on truth and reality.